Jewdyssee | PUMPKIN MUNCHKIN PIES: These Pumpkin Munchkin Pies are adorable and can be baked low fat. A delicious dessert that is also diet friendly? Dig in now! 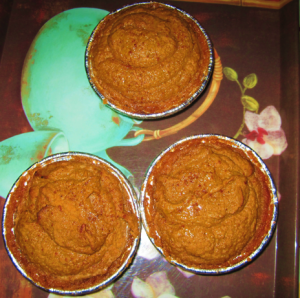 PUMPKIN MUNCHKIN PIES: These Pumpkin Munchkin Pies are adorable and can be baked low fat. A delicious dessert that is also diet friendly? Dig in now! I think Pumpkin pie is underrated. It’s a healthy dessert chock full of vitamin A, Potassium and fiber. But at the same time it’s a slice of delicious, cinnamon, creamy goodness. My Bubby I share a love for pumpkin pie. I wanted to try and create a healthier low cholesterol version so both me and my bubby could enjoy the treat without her having to worry about the high cholesterol or sugar content that most pies have. Thus was born the pumpkin munchkin pie! Sometimes my bubby and I eat them for breakfast with a cup of coffee and schmooze a little while we nosh. I don’t think it should only be relegated solely to Thanksgiving. The bright orange pie always has a place in my fridge. When this dessert is made with egg beaters and no calorie sweetener, the pies are almost- dare I say it? Guilt free indulgences! The no calorie sweetener that I use most often is Truvia. It’s made using the stevia plant, it’s pareve and it has no aftertaste. I just discovered the stuff not too long ago at my local supermarket, and I find that the pleasantly sweet flavor is so close to sugar that I can’t even tell the difference and neither can anyone else who tries my pumpkin muchkin pies. I included a low fat version using egg beaters and no cal sweetener for those counting calories and for those who feel “there ain’t nothin like the real thing” go for the eggs and sugar version! Either way you bake it, Bon Appetite’! Preheat the oven to 350degrees. First empty out the can of Libbys pumpkin into the mixing bowl. Then add the cup of eggs or egg substitute. Add the vanilla extract, the pumpkin spice, and the sugar substitute. Beat the pumpkin mixture with the hand mixer until the ingredients are evenly distributed and the batter is a smooth consistency. Place the mini Keebler pie tins in the 12 by 10 pans spray them with cooking spray and using a big spoon evenly divide the pumpkin batter among the tins. Generously spray the top of the mini pies so that they will form a nice golden crust and sprinkle a little cinnamon on top to taste. Place the tin pans in the oven (preferably on the middle shelf) for approximately 30minutes or until the pies form a nice golden peaks. Check on the pies after 15 minutes just to get an idea of how long to keep them in the oven. After they are done set them on a wire rack to cool and sprinkle a few pecan halves or a dallop of low fat whipped cream (I love cool whip free). I have seen plenty of useful things on your site about computers. However, I have got the judgment that laptop computers are still more or less not powerful enough to be a option if you typically do things that require plenty of power, for example video modifying. But for world wide web surfing, microsoft word processing, and many other typical computer work they are fine, provided you can’t mind the little screen size. Thank you for sharing your ideas. All I can think to say is wow! I think your info is intriguing and fascinating. You have done a great job on this article. If all writers could write this kind of quality information like you, readers would be more apt to understand more clearly the subject matter. This article is very well done. Nice read, I just passed this onto a colleague who was doing a little research on that. And he just bought me lunch because I found it for him smile Thus let me rephrase that: Thanks for lunch! “No one can wear a mask for very long.” by Seneca. fantastic issues altogether, you just received emblem new|a new} reader. What would you recommend about your submit that you simply made a few days in the past? Any sure? Together with every little thing which appears to be developing throughout this specific subject material, all your viewpoints are very exciting. On the other hand, I beg your pardon, but I can not subscribe to your whole theory, all be it radical none the less. It appears to everybody that your comments are actually not entirely validated and in reality you are generally yourself not really totally certain of your point. In any event I did take pleasure in examining it. Thank you for sharing excellent informations. Your web site is very cool. I am impressed by the details that you have on this website. It reveals how nicely you perceive this subject. Bookmarked this web page, will come back for extra articles. You, my friend, ROCK! I found simply the information I already searched all over the place and simply could not come across. What an ideal web site. I mastered more new things on this losing weight issue. One issue is a good nutrition is vital when dieting. A tremendous reduction in fast foods, sugary meals, fried foods, sugary foods, red meat, and white flour products may perhaps be necessary. Keeping wastes parasitic organisms, and wastes may prevent ambitions for losing belly fat. While particular drugs momentarily solve the problem, the terrible side effects are usually not worth it, and they never offer more than a temporary solution. It is a known fact that 95% of celebrity diets fail. Thank you for sharing your notions on this blog site. Thanks for another great post. Where else could anybody get that kind of info in such an ideal way of writing? I have a presentation next week, and I am on the look for such info. Thanks for your post. What I want to point out is that when searching for a good on the internet electronics shop, look for a website with complete information on important factors such as the level of privacy statement, security details, any payment procedures, and various terms plus policies. Constantly take time to look at help plus FAQ sections to get a superior idea of what sort of shop will work, what they are able to do for you, and exactly how you can make best use of the features. Very interesting info !Perfect just what I was looking for! ¡°Wherever the Turkish hoof trods, no grass grows.¡± by Victor Hugo.